These cinnamon doughnuts topped with cinnamon glaze are crisp on the outside, and light and fluffy on the inside! I used the same recipe, but made a few tweaks to take these to a whole new level. I just love how they have an irresistibly crispy outside, but the centre is soft and fluffy. The cinnamon glaze also gives these a deliciously sweet, velvety coating. A doughnut/cinnamon fan? You are going to love these. In a medium bowl, mix together the butter and sugar until smooth. Beat in the egg and vanilla until combined. Sift together the flour, baking powder, baking soda, cinnamon, and salt, then stir into the sugar mixture alternating with the milk until combined. Do not overmix. Roll the dough out on a floured surface to 1/2 inch thickness. 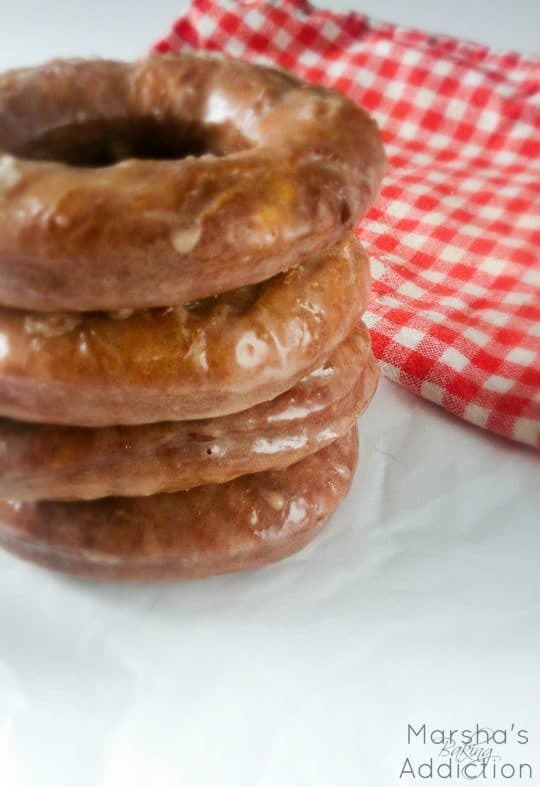 Cut into doughnuts using a doughnut cutter, or you could use a large round cookie cutter, and a small one for the centre. Let stand for about 10 minutes. Heat 1" of oil in a large deep skillet to 375F/190C. Fry for 15-20 seconds (or until golden brown) on each side, then remove from the oil.. Drain on paper towels. In a large bowl, whisk together all of the ingredients. If the mixture is too thick, add a bit more milk. If it is too thin, add a bit more icing sugar. Place each doughnut, that has cooled slightly, into the glaze, turning to coat. Allow the glaze to set for several minutes before serving. Wow, love the rich color on this one! I see doughnuts in my future. I’ve been craving them SO MUCH!! These look so good, will definitely have to try these at home! I am a doughnut cinnamon fan! You must have made these for me!!! Is it so wrong for me to want to lick the computer screen? These look too good to be homemade! ….now all I want is doughnuts. Looks great! WOWZA! These donuts look incredible, plus they are making me excited for fall! LOVE all the cinnamon-y goodness In and On these! Literally, I am drooling! Pinned! Cheers and thanks for sharing the yum! These donuts look incredible! And that glaze… yum!!!! It looks perfect! Love all the cinnamon you added. These are perfect for fall! Thanks, Kelly! I’m looking forward to more autumn recipes! This is a fantastic recipe that I need to try ASAP! My husband will LOVE them. I waaaaaaaaaant them sooooo bad!